The Hines Group is a manufacturer of precision components. We've specialized in precision metal components for over 40 years. We make your job easy. We lower your costs. We improve your competitiveness. We consistently deliver quick development, responsive support, and on-time delivery. We are certifiably compliant: ISO 9001, ISO/TS 16949, and ISO 14001. We offer production stamping, machining, and assembly. Our press capabilities are from 2 to 600T. We have a diversified customer base, including these industries: consumer electronics, appliances, automotive, industrial apparatus, small power, HVAC, recreation, and medical products. We serve the domestic market and export to highly competitive markets, including India, Malaysia, China, Europe, and Mexico. Since our founding in 1966, The Hines Group has become world renowned for its ability to produce some of the world's most challenging components. The Hines Group excels in the production of high-quality metal stampings with tolerances often held in microns. We also produce a number of wire-forms and strip forms, such as brackets, springs, and connectors. The Hines Group has earned a worldwide reputation as the leader in both quality and technical superiority. If you have any questions, please contact us. The Hines Group provides contract metal stamping and precision stamping services and parts at world-class quality and value. We are ISO/TS certified. We provide metal stamping product design assistance and rapid turnaround on production tooling and prototyped parts. Our capacity ranges from 2 to 600 tons. We provide complete support and contract supply including metal stamping, machining, finishing, plating, welding, and assembly. 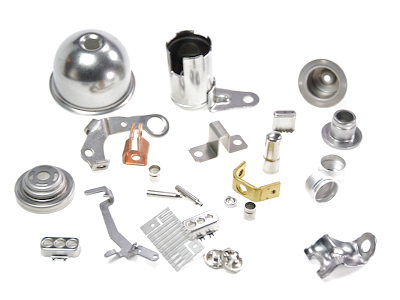 We supply many of the World's most demanding users of stamped metal components. The Hines Group is a U.S. company that competitively provides high-volume precision metal stampings, deep drawn stampings, and multislide stampings. We provide superior value when compared to suppliers in China, India, or Mexico. We recognize the importance of your part to your overall business. We treat your part with the care we would treat our own. We provide dedicated technical and customer service staff to serve your specific needs from concept to the end of the part lifecycle.